The crack in the top rear of the right hand driving horn gap. 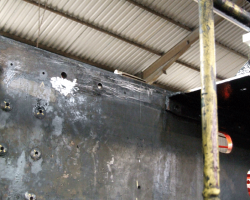 While it appears only small, once started cracks propagate rapidly, and a simple welded repair would be only a temporary solution; the crack is a long standing one which had been repaired in BR days. 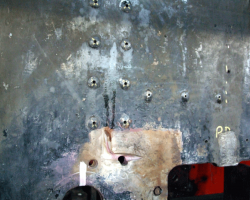 Note the rivets securing the stretchers marked by an X and drilled through ready to be burned out by the cutting torch. The section of frame to be replaced; the yellow arrows indicate the bottom of the vertical cuts which will extend for the full depth of the frame. The various markings will be transferred to the new plate to ensure that it accurately replicates the old portion. 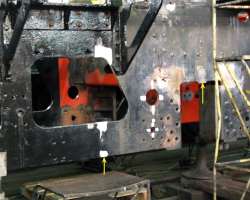 The running plate above the damaged section, as well as its supporting angle, have already been removed. Again, note the marked and drilled out rivets to the stretcher behind. 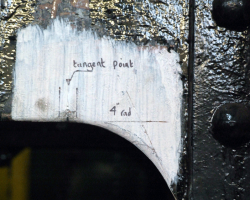 Some of the marks on the old plate section, to be transferred to the new one. The removal of a significant portion of the frame structure requires the bracing of what remains to maintain accurate alignment. Jigs to allow this are being made prior to any metal being cut, and one of the Fund’s working party is engaged in drilling such a jig. 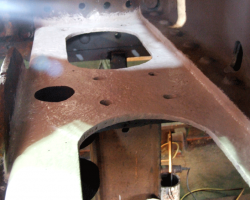 Although the frame crack repairs are currently the major work, other jobs go on around it. This is the lower stretcher supporting the pony truck pivot with the upper plate removed. As expected, it is in good condition; by the end of the day, the surface rust had gone. 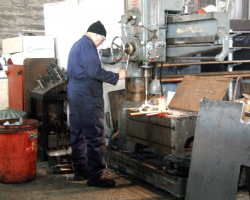 The mechanical lubricator feeding the cylinders and valve chests has been refurbished, repainted, fitted and the lubrication pipework connected. 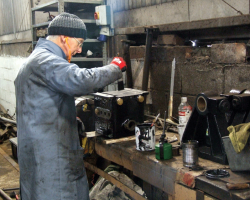 The one for the axleboxes begins the same process, here fully stripped down and receiving a coat of black paint from a Fund volunteer. 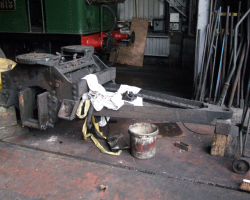 The wheelsets have been ultrasonically tested and no defects found; they are now cleared to go to the South Devon Railway for tyre and journal turning as needed, probably in the next couple of weeks. The race is therefore on to complete cleaning and to apply a coat of primer paint before they leave, and one of the Fund’s volunteer is so occupied. The pony truck wheels will also visit the SDR and have been removed from the truck. The truck itself is otherwise still in one piece, but every split pin has been removed and all nuts and all bolts freed by Fund volunteers ready for when its time for attention comes.